Wednesday Wakeup: Does Obama Want to Own the Airlines? Does Obama want to own the airlines? 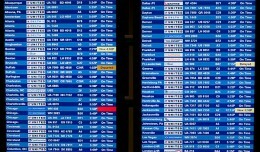 A new ground management system at JFK. Thunderstorms wreak havoc on New York-area airports. Boeing issues an ultimatum. Senators Hillary Clinton and Chuck Schumer announced that the US Department of Transportation has allocated over $16 million for upgrades at Kennedy and LaGuardia airports. Despite its stellar record of passenger care, Southwest has been caught breaking federal rules with regards to how it treats passengers bumped from oversold flights. Most US airlines oppose the DOT's new fare advertising rules, but Spirit's public campaign against airfare transparency insults the intelligence of consumers.